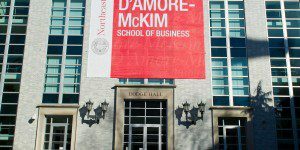 The Northeastern University part-time MBA at D’Amore-McKim School of Business starts in September and January of each year. While it can typically take between two and seven years to complete the program, the time frame is up to the student. The school requires 60 credits and a 3.0 GPA in order to graduate. There are even two start times for evening classes as well as on Saturdays and online. The Northeastern University part-time MBA is comprised of 60 semester hours of credit and the option to participate in one of the International Field Study programs, which are approximately one to two weeks in length. While these courses can be taken in any order, the school provides a suggested curriculum that allows students to complete their degree in three years. In order to do so, students who start in September take approximately six credits each fall and spring and nine credits each summer. This includes one elective the first summer, three the second summer, and five throughout the third fall, spring, and summer semesters. Students can pursue electives that allow them to fulfill an area of specialization, which Northeastern offers in Corporate Finance, Corporate Renewal, Entrepreneurship, Healthcare Management, International Business, Investments, Marketing, Mutual Fund Management, Supply Chain Management and Technological Entrepreneurship. The most recent part-time MBA class consists of 70 students with an average GMAT score of 586 and an average undergraduate GPA of 3.21. Around 37 percent of the class is made up of female students, and 9 percent of students are traditionally under-represented minorities. Students complete an average of six years of professional experience before matriculating at Northeastern. The Northeastern University part-time MBA program costs $1,600 per credit hour for the academic year, totaling $96,000 for the entire 60-credit program. Scholarships are available to any student in their first year of study, providing partial- to full-tuition reimbursement based on the strength of an accepted student’s application. Awards do not require a work commitment, and there is no separate application necessary. Scholarships may be renewable. Applicants must submit a completed online application, two letters of recommendation, a professional résumé, transcripts from each college or university attended, GMAT or GRE scores, personal statement and a $100 application fee. International students from non-English-speaking countries must also submit score reports from the TOEFL, IELTS or PTE Academic, and non-citizens who are permanent residents must submit their Green Card. An interview is required for admission and is extended by invitation only. GMAT/GRE waivers are offered to select students that have at least five previous years of professional work experience an a GPA at or above 3.0.